If you've driven by a wind farm, or have looked with awe at the gorgeous new skylights that double as solar panels, you've probably wondered what the future of energy will be. What will happen to petroleum? How can we be cleaner and how can we more efficiently use the resources we have? Welcome to an interview on LifeEdge with Richard Chuchla, Director of Energy and Earth Resources Graduate Program at the University of Texas in Austin. Richard, a retired executive of a major energy company, has used his very unique background to contribute to a program that is truly unique in the world. Richard talks about the state of energy needs in the world today and in the future and how this has changed since he graduated. As a result, graduate education must change to prepare students for a more diverse and complex energy world. Rather than geoscientists or petroleum engineers alone, we must prepare people to be energy practitioners, with multidisciplinary training so that they can enable sustainable interdisciplinary solutions. As you watch, don't miss the great photography, the informative presentations, and the interesting chat about volcanology and the Yellowstone super-caldera. People learn from each other and in online courses, the quality of interactions between students in their collaborative activities and with instructors is very important. 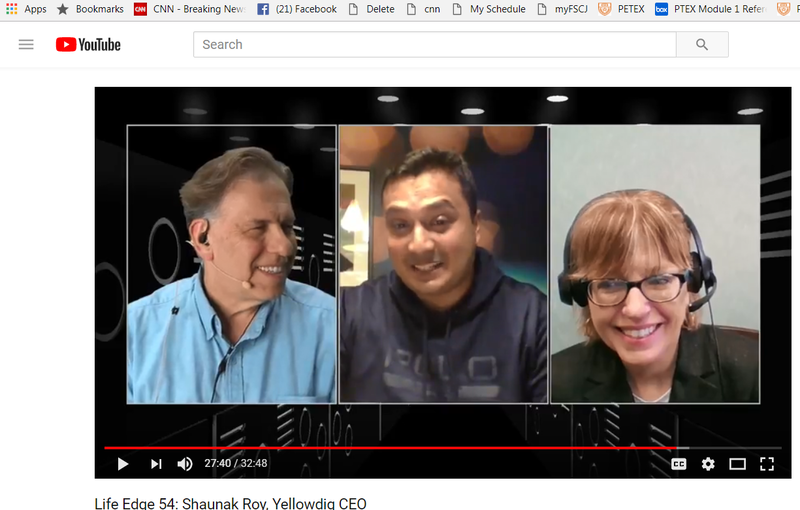 Welcome to an interview with Shaunak Roy, founder and CEO of Yellowdig, a social learning platform that has been developed with the goal of enhancing the learning experience. My name is Shaunak Roy, and I am Founder and CEO of Yellowdig, a social learning platform for education. I started Yellowdig with the fundamental believe that there is something magical about peer learning. Casual conversations, exchange of ideas, or occasional debates help form meaningful bonds with other learners, which make learning more fun, and real. As I look back into my own MIT and IIT days, I realize that I have learned as much from my peers as I have from my favorite professors. Some of those bonds have lasted well beyond those formative years and have morphed into lifelong friendships. 2. What is Yellowdig and what does it do? Yellowdig is a social learning platform that merges and combines the power of group learning and rapidly expanding real-time content from the internet into a seamless and easy to use learning platform. Yellowdig is Software as a Service (SaaS) that integrates into all Learning Management Systems (LMSs) and Portals to offer 1-click socially intuitive groups for a variety of use inside and outside of courses. For example, Yellowdig can be added in an individual course within minutes to offer a FERPA compliant, private and moderated collaboration forum for your course. 3. How is it different than other collaboration apps? · Automatic grading and gradebook sync : Instructors can set up a points system to encourage learner participation, that is fully customizable from course to course. · Privacy and moderation : All the content remain private to a course and can be moderated by the Instructors and admins encouraging deeper and authentic participation. 4. How are universities using the app? Yellowdig is bring used by over 40+ institutions and 140,000 learners across online, blended and residential courses and MOOCs. 5. Many collaboration applications are not used in courses because they require so much extra time from the instructor. How does Yellowdig approach that problem? We recognize that engaging students through prompt driven discussion and manual grading of discussion posts is a major time sync for instructors. In fact, this type of discussions tend to lower the quality of engagement as it feels less like organic sharing of ideas and more like assignments for the learner. Yellowdig, though peer driven discussion and automatic grading, substantially reduces instructor time commitment while improving both quality and quantity of engagement. You can refer to our blog for many stories from instructors on how Yellowdig has helped them improve their instruction without increasing workload. We plan to continue to build our vision of making learning more engaging and real-world. We plan to add more features and data capabilities to help instructors and students get more from their learning experiences, from anywhere, at anytime and from any device. Our competitive advantage is our focus on working closely with our instructor community to co-curate the future of eLearning. We tend to think of drones as the only kinds of aerial robots, but Apellix has developed an aerial robot that can be used to deliver products instead of simply sensing or collecting images. 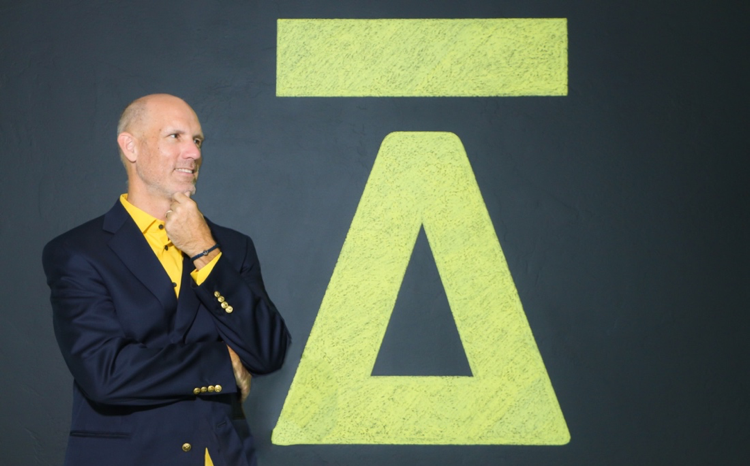 Welcome to an interview with Bob Dahlstrom, CEO and founder of Apellix, a dynamic, new aerial robotics company. 1. What is your name and your relation to innovation and robotics? Bob Dahlstrom – Growing up working at my parents’ hardware store from age 12 to my early 20’s provided me hands-on experience with the practical needs of people to fix, repair, or replace a wide variety of items – often with innovative mechanical solutions. Later, in the mid-80s while working in a “clean room” at an integrated circuit manufacturer and writing software code for the first time, I made the connection that the world was destined to have software interact with and instruct hardware, as we moved from physical and electrical mechanical systems to software-controlled systems. Founding a software company in the 1990s that was finally, 13 years later, an “overnight success” provided me more exposure to software and is where I became unequivocally adamant that software was “eating the world”. Apellix is my first robotics company. To me, robots are software. Looking at things through a software lens, I believe aerial robotics (drones) are just flying computers and with the right sensors and data - and most importantly, software - they can be made to do most anything. 2. What is Apellix? How did you get started with it, and what is its mission? Apellix is a technology company focused on creating systems to keep workers safe. We are passionate about designing and creating software-controlled robotic systems that keep people out of harm’s way and save lives. We live in a time when the fantastic has become ordinary. No longer do we have to imagine mythical machines and buildings out of science fiction movies. Our telephones are pocket computers now. Why are people still hanging from skyscrapers cleaning windows, or working from scaffolding cleaning and coating structures, when we have robotic systems that can do the work safer and most likely more effective and efficiently. 3. How do aerial robots work and how are they different from drones? This is a FANTASTIC question –An Aerial Robot includes a “robotic arm” and an “end effector”. A “robotic arm” is a type of mechanical arm, usually programmable, with similar functions to a human arm. Robotic arms may include a manipulator and may be connected by joints allowing either rotational motion (such as in an articulated robot) or translational (linear) displacement or can be a lance or probe. The terminus or end of the arm is called the “end effector” or probe tip. End effectors are the device at the end of a robotic arm, designed to interact with the environment. The exact nature of this device depends on the application of the robot. An Aerial Robotics system includes a robotic arm with an end effector AND the ability to fly close to, touch, or modify a structure or surface. Just the fact of having an arm with an applicator / end effector on it requires flights wherein the lift platform (the drone) must fly with precision close to structures. Drones, and all aircraft in general, are designed to fly away from potential obstacles, not close to them. 4. What are the main applications of the Apellix robots? 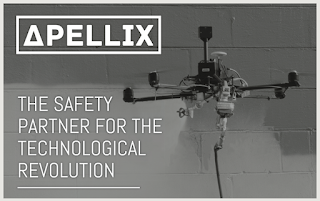 Apellix is an early-stage company and the leader in aerial robotics. It is the only company with proven capability to measure the thickness of steel on a 300’ flare stack or clean and paint a wind turbine 260’ off the ground. With proprietary circuitry, software, and power management systems, our Apellix-designed drones serve as industrial tools capable of all-day continuous work. Our initial product, currently available for pre-orders, is in the field of contact-based Nondestructive Testing (NDT) for evaluating the properties of materials in industrial and infrastructure assets such as bridges, ships, oil & gas refineries, and more. For example, we test the thickness of steel or the protective coating of a bridge to ensure it is structurally sound. The Apellix SmartBee™ platform provides the capability for multiple types of Nondestructive Testing. One example, designed for a ship manufacturer, conducts dry-film thickness (i.e. paint thickness) testing pursuant to SSPC-PA2 standards on vertical ferrous surfaces at height. The aircraft is piloted manually to the initial test location where the computer operator (pilot) engages the software using our PC / tablet-based user interface, and a pre-programmed sampling process begins. All actual testing is conducted under 100% computer control. During the sampling process, test results are provided in real-time to the operator on the base station (computer laptop or tablet), displaying the actual paint thickness measurement and whether the surface is compliant. Once the sampling is complete, the aircraft returns to a safe position and awaits pilot commands to direct it to the next location. For each measurement, environmental data, GPS positioning, project data, photo confirmation, and related aircraft data are stored for one-step download to an Excel spreadsheet (csv). Aircraft performance and use data are also tracked via Internet of Things (IoT) for predictive maintenance and development purposes. 5. Why did you choose the robots to be aerial rather than placing them on scaffolding or some other fixed structure where they could move back and forth, but not have to be airborne? By freeing robots from the ground and allowing them to operate in 3-dimensional space, we have created a set of affordances not available to ground-based or place-bound robotics. One example of this would be painting a large cargo or cruise ship. Currently, to paint the side of a ship, it takes a crew of 30 workers 4 to 5 days to set up the scaffolding, paint, and remove the scaffolding. The paint is applied is 6 to 8’ sections (the length of a painter’s reach without moving to a new section of scaffolding) and “feathered” to ensure proper coverage at the edges of where a person can reach. This results in a large number of areas where the paint is overlapped. 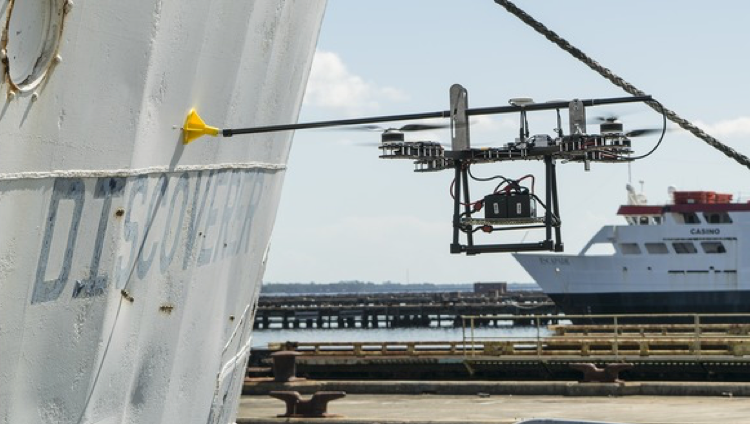 A tethered aerial robotic system, with paint and power on the ground, would allow painting to start in the far-left corner of the ship’s hull, move horizontally to the far-right corner, and turn off the paint. It would then move down to allow a 12” overlap, turn on the paint and proceed horizontally to the left. This efficiency enables a much better paint job with fewer potential failure points. 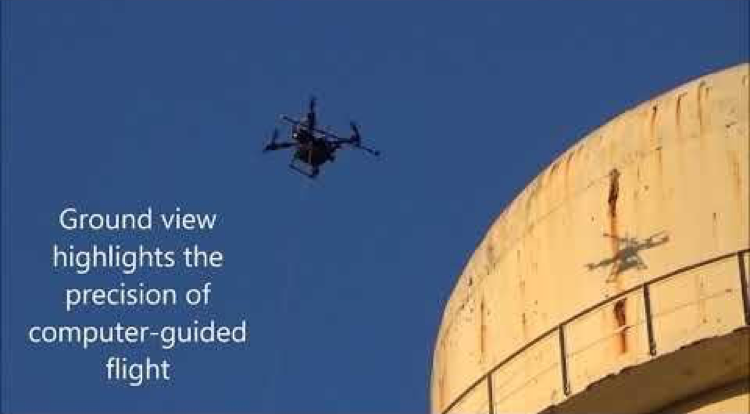 Apellix has conducted proof-of-concept testing in which our aerial robots successfully delivered water-based coatings using 3300psi industrial airless pump systems on vertical surfaces. We have tested at flow rates up to 1.6 gallons per minute. Apellix is currently conducting proof of concept testing where our aerial robots provide no-touch cleaning using non-combustible cleaning solutions and pressurized water rinsing. We expect to expand testing to include limited blasting as well. Apellix is currently seeking industry partners to support this additional testing and development. 6. How do you compensate for wind and humidity when you are working on large ships, equipment, bridges, etc? 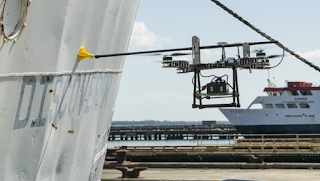 Apellix aerial robotic systems use large, computer-controlled, heavy-lift multi-rotor drones outfitted with various sensors and functions to allow precisely controlled flight close to structures. Manual control of such systems is unable to accomplish the precise flying and maneuvers required, thus software-controlled flight is crucial. While drones often operate in 15-knot winds, their operations are confined to keeping a tight camera focus on the target, so wind moving the drone a foot or two in any direction is not critical. In an aerial robotic system, such as those used by Apellix, flying inches from a structure a sudden gust of wind can be catastrophic. The amount of time it takes to see something and move your finger is approximately two-tenths of a second. In that amount of time, a computer with a standard Intel Core i7 or similar processor can make 63 million calculations (~315,000 millions of instructions per second – MIPS), thus computer control can allow an amazing degree of control and stability, even in high winds. As I like to say, aerial robots (and drones) are flying computers and, with the right sensors, they are data gathering machines. 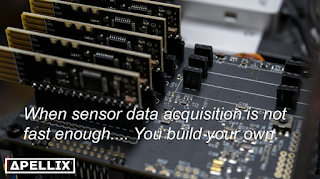 Each Apellix aerial robot has a full onboard computer with an Intel x86 processor, a full server-based operating system, and a custom-built Apellix sensor board, giving it the ability to collect a lot of real-time data, including environmental variables such as ambient air temperature, barometric pressure, relative humidity, atmospheric levels of oxygen and gases and more. The Apellix WorkerBee™ is under development to enable aerial applications for cleaning and for spraying paint. Part of the efficiency of painting is what’s called the transfer efficiency ratio (Transfer Efficiency (TE) = Weight of Material on the Target (WT) / Weight of Material Sprayed (WS) x 100%). For example, the average material loss is 30%, but moving the spray nozzle 7” from the optimal distance changes material loss to 50% or more. By knowing the humidity, temperature, recommended application rules, and more, we can calculate the optimal distance for the spray nozzle from the structure being coated, thus minimizing over-spray and under-spray. Paint is heavy, and so are batteries. Our solution, in addition to the software-controlled aerial lift platform (the drone,) is to keep them on the ground and utilize an umbilical cord to send power and material up to the aerial systems. This allows for theoretical all-day operations, something needed in an industrial aerial robotics system. Of course, depending on the use case and customers’ requirements, we can also offer a non-tethered system for small touch-up or repairs. 8. What have your experiences been thus far? The interaction of people and robots is complex and growing more sophisticated all the time. Apellix painting platforms are run by operators on the ground. They work at heights, without putting the operator in danger, and allow the work to be performed to greater precision via software control than a human can do. It replaces hours of work by humans. But it doesn’t take human control out of the loop. It does change lives. Robotics are reducing occupational hazards. They’re saving our tax dollars for the corrosion prevention of public assets, such as highway bridges and battleships. They’re saving private dollars on protection of buildings, ships, above-ground storage tanks, and oil rigs. 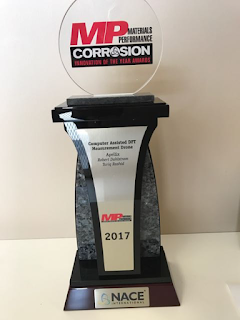 Executives from around the world are flying into Jacksonville, Florida to speak with us about our innovations, we’re winning local, state, national, and international startup and robotic competitions, and industry awards such as a 2017 Innovation of the Year from the National Association of Corrosion Engineers (NACE). It’s amazing working with magical flying machines every day. The technical work we do at Apellix today is possible due to the great work and science of those that have come before us. But more importantly, to me personally, the most memorable experience can be summed up from a recent conversation I had with the CEO of a company in the oil & gas space who said; “Bob, I’ve had to tell 5 mothers their sons are never coming home again”. If we can engineer out the risks of falls, injuries, and deaths from the job site and prevent these types of conversations from happening, that is a win for everybody. 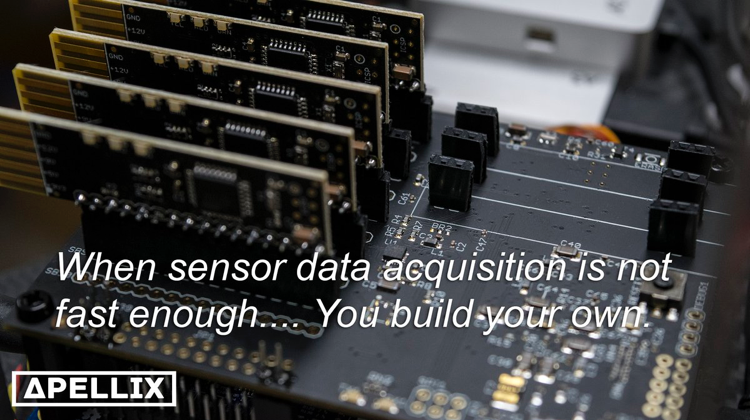 Perhaps most satisfying to the A Team (Team Apellix) is that we’re adding to the greater body of knowledge, specifically data on the maintenance of expensive assets. We’re helping to save lives. 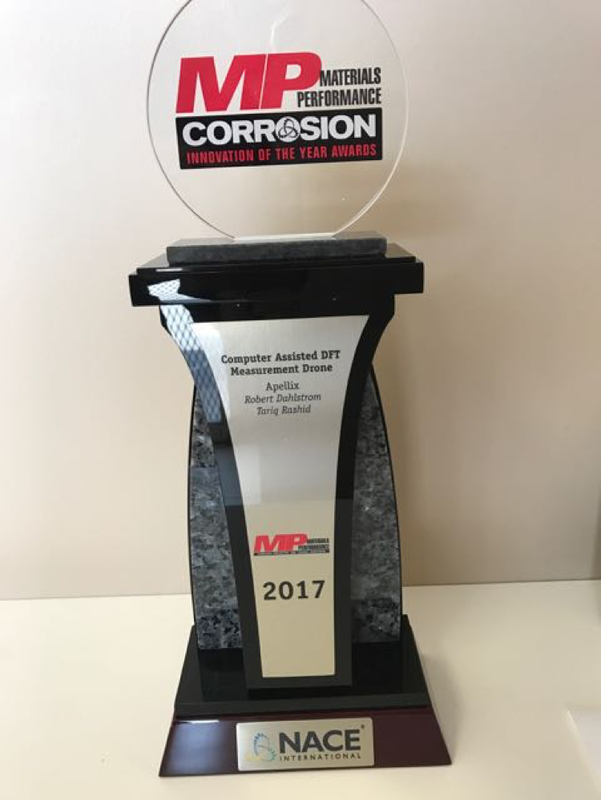 And we’re at very least winning battles in the never-ending war on corrosion. 9. What is the future for Apellix? Apellix will continue to work on and refine its SmartBee™ and its WorkerBee™ platforms and add additional features and functions. For example, now that we control, with great precision, the flight of an aerial robotic system in close proximities of structures and even touch structures we can add most any type of end effector or tip to the robotic arm. 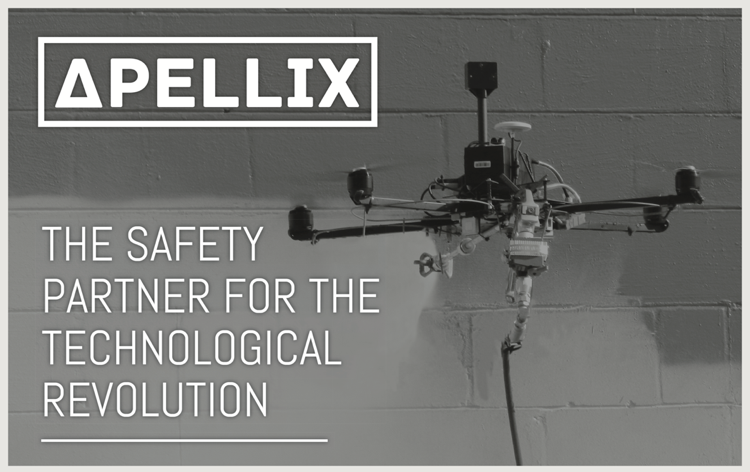 Thus, devices that are currently handheld and touched to the concrete on a bridge to measure corrosion of the rebar embedded into the structure can be placed on the Apellix aerial robotic system. This eliminates the need to rappel down a structure or utilize cranes or scaffolding to climb up to areas of the structure to take the readings. As the advantages of the Apellix aerial robotic platform become more widely known and understood we fully expect to learn of a multitude of items of different types that can create value when carried or added to the platform. The future is bright, keep your eye on Apellix.